Sweet Lawns, Inc. (the “Company” or “Sweet Lawns”) is a premium provider of lawn care, tree & shrub care, and specialty services to residential and commercial customers throughout Northeast Ohio. MelCap Partners, LLC (“MelCap”) successfully represented Sweet Lawns in the sale of the business. As the Company’s exclusive investment bankers through this process, MelCap assisted Sweet Lawns in selling the business to the most logical strategic buyer. 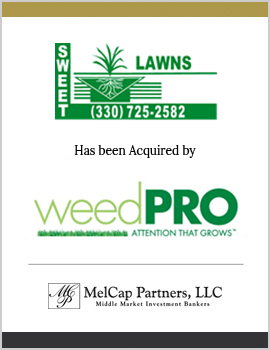 In order to support the Company’s strategic growth plans, and to provide its customers with continued high-quality services, MelCap sold Sweet Lawns to Weed-Pro, Ltd., a leading provider of lawn care services located in Sheffield Lake, OH. We work with you to ensure that we understand your goals to put a plan in place for your transaction.